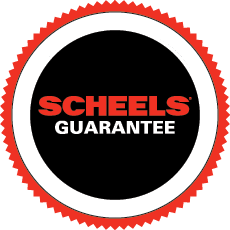 The 145,000 square-foot SCHEELS in the Kirkwood Mall is a retail shopping experience that showcases western North Dakota’s largest selection of sports, sportswear, and footwear under one roof. Special attractions include a nostalgic shooting gallery, a Buck Hunter simulator, rollerball, Ginna’s Fudge and Coffee Shop, and a 5 sport simulator with sports including basketball, soccer, hockey, baseball and football, where customers can test their skills. SCHEELS first opened its doors in Bismarck at Arrowhead Plaza in 1973, and moved to the Kirkwood Mall in 1984. The newest move within the mall makes this SCHEELS the largest in Western North Dakota. Unlike a typical sporting goods store or department store, the Kirkwood Mall SCHEELS is a collection of entertainment venues, as well as women’s, men’s, youth, specialty, and sport and game shops. Brand-name concept shops by Nike, adidas, Columbia, Under Armour and The North Face feature the best sport apparel products. Each shop is staffed with experts who are focused on their passions. The Bismarck SCHEELS features boutiques ranging from technical running gear and the latest fashion sportswear to spectacular hunting and fishing shops. The athletic shoe, hiking boot, and casual footwear selection are the largest in western North Dakota with everything for toddlers to serious climbers, and selections ranging from beach sandals to fashion boots for women. Outdoor enthusiasts will experience world-class shops including golf, bike, ski, paddle, and sport and game shops. The gun and hunting shops house the largest retail selection of guns in the region, ranging from everyday shooters to collectible guns. Greeting you at the entrance of the store is a beautiful, custom-built lodge that features Ginna’s Fudge and Starbucks® Coffee Shop, which serves 24 flavors of fresh homemade fudge, Bavarian roasted almonds and gourmet coffee. Ginna’s also offers a large selection of made-to-order sandwiches, salads and soups to satisfy your appetite. Come test your hunting skills in our Big Buck Hunter simulator! Test and analyze your swing in our golf simulator!